Let no man in the world live in delusion. Without a guru none can cross over to the other shore. So says Sri Guru Nanak Devi Ji. Each being in this human form needs a spiritual master to achieve the goal of his life. Human life is the utmost gift of Lord to a being. A human body is blessed by the Lord to be one with him. But to do so, one needs a medium to achieve this goal. After all, as per Guru Nanak Dev Ji, if there is one God, then there is only one way to attain him, not another. One must follow that way and reject the other. Our ancient scriptures explain that the way to attain the Lord is through a true spiritual master only. Importance of such a true master in human life was reiterated in monthly spiritual congregation held at Dehradun, Uttarakhand on 24th June 2018. Pious Vedic mantras marked the beginning of the event followed by prayers at the Lotus feet of our revered Gurudev Shri Ashutosh Maharaj Ji. Then began the session of bhajans by our trained musician disciples. 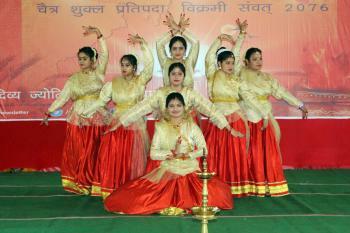 They expressed the divinity and importance of guru in our life in the form of melodious bhajans. These bhajans mesmerized the audience and held their attention for a long span of time. Multiple preachers addressed the audience and explained the importance of guru in human life for reaching the destination. These monthly congregations serve as a reminder for the disciples to reflect upon the divinity of his guru and how his grace is leading us to the path of true spiritualty. The remembrance of Guru created an emotional aura in the surrounding area. Such events hold an important place in the life of a disciple. They help to replenish the Bhakti Bhawna of a disciple in Lord’s feet. 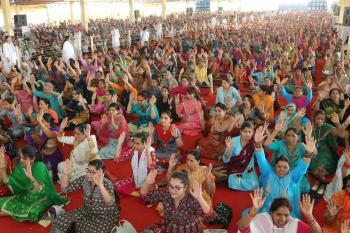 The amalgamation of divine music and Satsang held the audience together during the event. Disciples realized the importance of such events and participated in them whole heartedly. These monthly events serve as nectar to parched souls. Marking the end of the event, Bhandara was organized for the masses as prasadam.